The Andaman coucal (Centropus andamanensis) aka brown coucal belongs to the family of cuckoos, the Cuculidae. 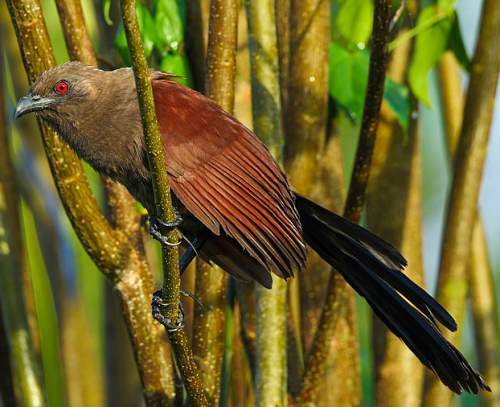 The Andaman coucal species is distributed in Andaman and Nicobar Islands of India and Coco Islands of Myanmar. These brown coucal species are endemic to these islands in the Bay of Bengal. These coucals are monotypic species. The Andaman coucal (Centropus andamanensis) is a large coucal, measuring 45 to 50 cm in length and weighing 230 to 300 grams. The overall plumage is shades of brown. The head, mantle and underparts are pale grayish brown. The rear mantle and wings are chestnut brown. The tail is pale brown at the base and darkens towards the tip. The bill has downward curve and is dark metallic gray. The irises are deep red and there is a brownish eye ring. The legs and feet are blackish gray. The call of these coucals is a series of deep, resonant "hoop..hoop..hoop" and also chuckling and grating sounds. The Andaman coucal species is distributed in India (Andaman Islands, Great Nicobar Island) and Myanmar (Great Coco Island, Little Coco Island and Table Island). The Important Bird and Biodiversity Areas (IBA) of these coucal species are, Baratang-Rafters Creek, Jarawa Reserve, Kadakachang, Landfall Island, Wandoor National Park, Mount Diavalo, Mount Harriet, Sentinel Islands, North Reef Island and Rani Jhansi Marine National Park. These Andaman coucal species have moderate forest dependence. They normally occur in altitudes from 0 to 100 meters. The artificial ecosystems and habitats of these species include cultivated lands, flooded agricultural lands, pasturelands and thickly covered gardens. The natural ecosystems and habitats of these species include, subtropical and tropical moist lowland forests, subtropical and tropical mangrove forests and swamps. The diet of the Andaman coucal consists mainly of insects. Grasshoppers, crickets, moths, insect larvae, small frogs, crabs and lizards are their primary food. The breeding season of these Andaman coucal species is from February to July in Indian Islands. The nest is a dome of twigs, grass and leaves placed on the tree. The clutch contains two or three chalky white eggs. These Andaman coucal species are non-migratory and are resident birds. Post breeding, the juvenile coucals may disperse and establish in new locations within the range. They may make local movements for feeding and breeding within their range. The global population size of the Andaman coucal (Centropus andamanensis) has not been quantified. The overall population trend of the species is considered to be stable. Throughout its range, this coucal species is reported to be common. The generation length is 3.8 years. Its distribution size is about 77,700 sq.km. Habitat alteration and destruction and deforestation are the main threats that are endangering the survival of this coucal species. 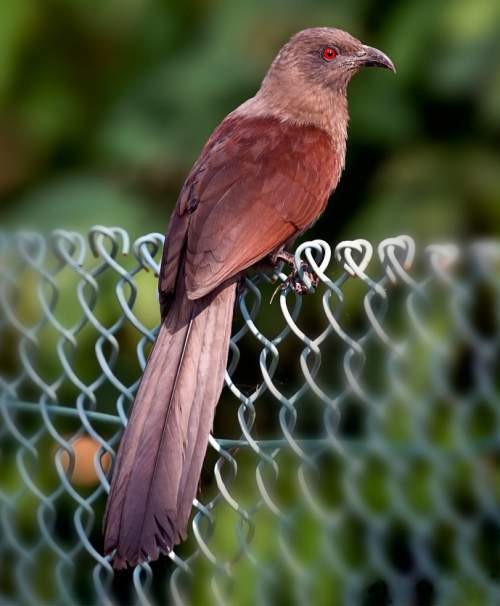 The Andaman coucal (Centropus andamanensis) does not approach the thresholds for being Vulnerable either under the range size criterion, or under the population trend criterion or under the population size criterion. The IUCN (International Union for Conservation of Nature) has categorized and evaluated the coucal species and has listed it as of "Least Concern". The CITES (Convention on International Trade in Endangered Species of Wild Fauna and Flora) status is ‘Not Evaluated’ for Andaman coucal (Centropus andamanensis). The Andaman coucal (Centropus andamanensis) is closely related to the greater coucal (Centropus sinensis). Current topic in Birds of India: Andaman coucal - Centropus andamanensis.